Pet ownership is more than just feeding and walking your dog. Your pup’s comfort and overall health are integral to his happiness – but you already knew that. That’s why we created the PET GAZEBO®. Whether you’re spending these autumn days raking up leaves outside, camping in the woods, or simply lounging indoors with your pooch, we believe that the PET GAZEBO® will keep your pet comfortable, content, and most importantly, safe. Its drop-down window allows owners to easily distribute food and water dishes into the enclosure and the latching door will prevent your good boy from darting out unexpectedly. 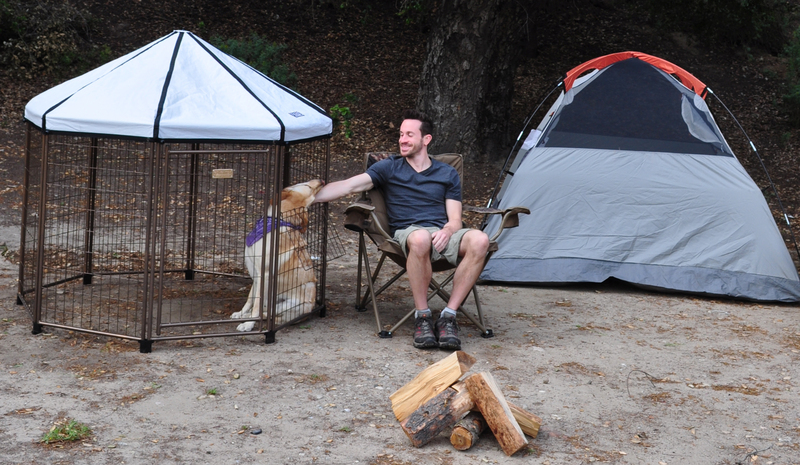 If your pet is up to 60 pounds, our 3-foot PET GAZEBO® is perfect for indoor use. If it’s being used inside, this size is an excellent choice for dog breeds such as Australian shepherds, beagles, basset hounds, collies, and golden doodles. If you’re keeping your dog outside, you’re going to want to give your pet a little more space. 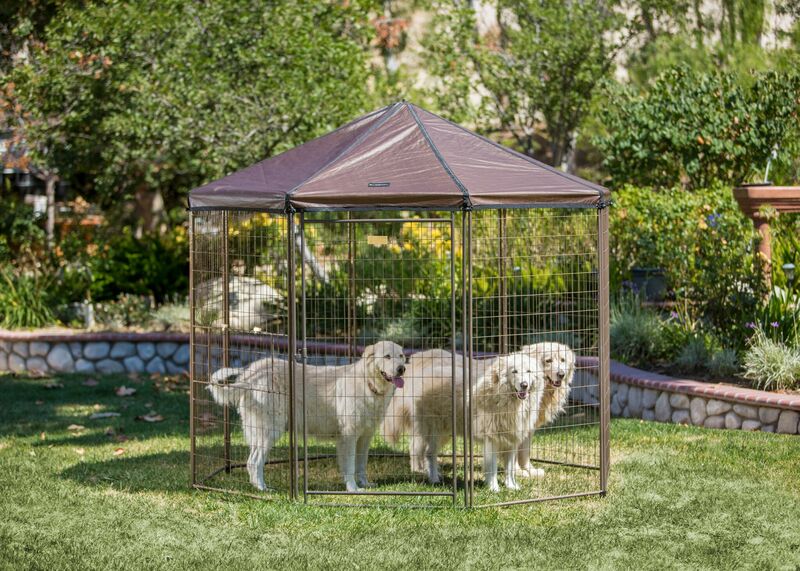 In this case, use your PET GAZEBO® for pooches up to 20 pounds. The slightly roomier 4-foot PET GAZEBO® is perfect for pets weighing 100 pounds or less if you keep them inside or if you’re staying outdoors, use it for medium pets weighing up to 40 pounds. Your Jack Russel terrier will enjoy having room to stretch his legs outside and you’ll have peace of mind knowing he’s safely enclosed. 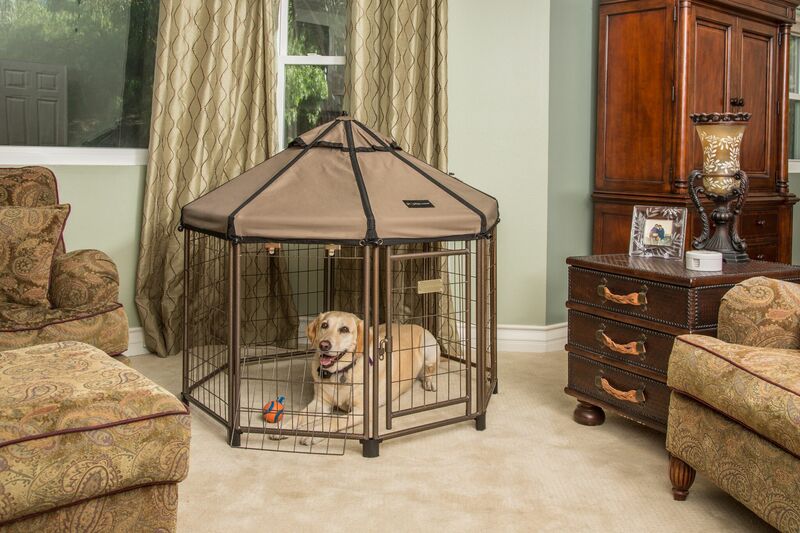 The 5-foot PET GAZEBO® is great for indoor dogs that are up to 200 pounds that want to rest and relax. This indoor crate is ideal for breeds such as Great Danes and Irish setters. If you’re staying out, the 5-Foot PET GAZEBO® functions as an outdoor kennel for dogs up to 80 pounds, like Labrador retrievers and greyhounds. Finally, our most spacious PET GAZEBO® provides more than enough room for your 350-pound dog to sleep indoors and is just right for pets up to 200 pounds that need a kennel for outside. You can even fit two smaller dogs inside this PET GAZEBO® who can keep each other company while outdoors. The PET GAZEBO® provides a stylish, comfortable place for your pets to relax anywhere. You can also customize your PET GAZEBO® the way you want with our various accessories, such as canopies, window and side panels. Interested in buying or selling our products? Learn more by visiting our website to contact us today. Hi Joel, THanks for reaching out. All parts are available on our website: https://petgazebo.com/ or you may reach out directly to our customer service team at (800) 664-4939. They would be happy to assist you.